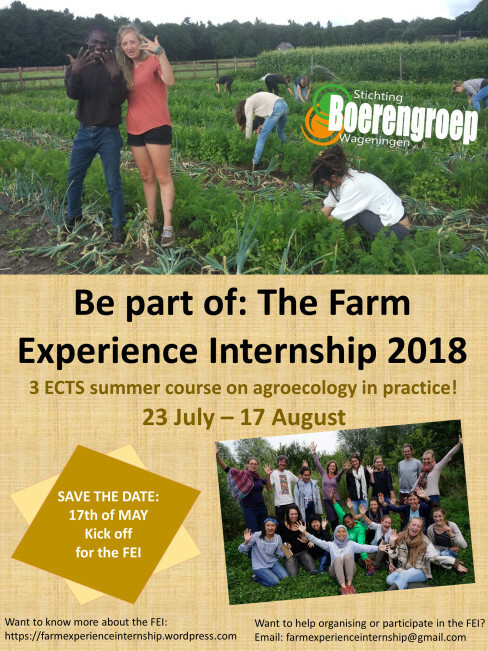 Since 2013 Boerengroep is organising the summer course ‘Farm Experience Internship’, or “The FEI”. The FEI origins from Brazil where students felt the need to bridge the gap between the university and the farmers, and decided to set up a course about agroecology, both in theory (2 weeks at the university) as well as in practice (2 weeks at the farm). The Farm Experience Internship is one little step forward in the fight against agribusiness, by connecting students with the reality and needs of farmers. As we feel the same need, we are organising this course in Wageningen now for the sixth year in a row! Want to know more about the FEI or do you feel like getting into the FEI for just an evening? Join us on the 17th of May for the Agroecology Evening – Kickoff for the FEI 2018! And check out the FEI website! The Farm Experience Internship (FEI) is a growing movement, that is being co-created by peasants, farmers, gardeners, scientists, students, activists, NGOs and agroecological companies – working together towards a sustainable, healthy, viable food system that is fair and just for the earth, the consumer and the producer. Together, we co-organize a 3 ECTS international summer course at the Wageningen University every year (since 2013), which intends to bring together theoretical knowledge from students with practical skills and knowledge from farmers. Are you interested in growing your own food, discovering local knowledge and practices on organic farms and gardens in the Netherlands? Do you want to learn about agroecology, food sovereignty and sustainable food systems? Or would you like to interact and discuss with farmers to find creative, innovative ways of farming? Then don’t wait any longer and join the FEI! This evening we like to invite you to come to the Hoge Born – organic farm very close to the University- and get engaged into Agroecology as a science, movement and a practice! At this special location we organise a full evening program focused on linking theory and practice in agricultural research. 1. PREPARATION – Lectures, workshops, excursions. During the first phase of the FEI, you will get to know about all kinds of topics related to agriculture, e.g. agroecology, sustainable food systems, food sovereignty, seed patents etc. We share knowledge, eat together and have a good time. The preparation week will be held at The Building with the Clock (Generaal Foulkesweg 37, Wageningen) and the schedule is full day. 2. LET’S GO FARMING! Practical experience on a Dutch farm. After the preparation week, each student is sent to a different farm somewhere in the Netherlands. Before the start of the FEI, you can tell us your preference, e.g. food forest, goat farm, organic garden etc. For two weeks you will be full time working together with the farmer, following his/her working rhythm, learning practical skills and local knowledge. Students are asked to make pictures or a short video about their stay at the farm, which they will present later on. The participating farms are mostly organic, however some are currently still seeking for a more sustainable management practices (which is very interesting for you as a student: can you find ways to support the farmer?). After two weeks harvesting, weeding, feeding cows, goats, or making cheese, students will come back to Wageningen for the evaluation phase. Share experience, discuss what you’ve learned and create the one and only FEI Story Book!